Garran Zachary Howard was born April 2, 2001, fourth child of four beautiful children. After a perfect pregnancy and a perfect delivery, from birth Garran started having problems. He stayed in the hospital for over a week following birth because his oxygen saturations kept dropping whenever he ate. At two months Garran was diagnosed with Cystic Fibrosis after having failure to thrive. The next 6 years he spent in and out of the hospital for respiratory issues. In October 2007 Garran's father was deployed to Iraq. On December 25, 2007 Garran went into respiratory failure. His Doctor in Portsmouth VA said that he was seconds away from meeting God. He spent the next 30 days in the hospital on a ventilator, and on dialysis from renal failure. It was at this point that his doctor in VA referred us to see the transplant team at UNC.He spent the next few months being evaluated for transplant, we were even told that he might not need one at one point, but in July 2008 he had another very bad turn for the worse. His right lung collapsed completely and his left was barely functioning while we were still living in VA, he had 2 chest tubes placed to try to re-inflate his lung and was again placed on the ventilator. Things became bad enough that the team at UNC thought it best for him to be air lifted to UNC. It was apparent at that time that he would most definitely need a transplant. So on July 18 2008 Garran was listed for transplant. With my husband and three other children living in VA still, Becky and the Sweet Melissa fund were so great to pay for living expenses for Garran and I while he waited for lungs so we could be close to UNC and not have to pay two house payments. And in January 2009 the Sweet Melissa Foundation helped us move into a larger house so that all of us could be here together while we waited. Many of you remember Garran running around here December 2008. It is hard to believe that a child running around with that much energy on Oxygen had less than 15% lung function. Garran has always defied the odds. Every goal that his providers set for him, he always exceeded, plus some. On February 2, 2009 (groundhogs day) Garran received the gift of life. In less than a month he was out of the hospital and anxious to live. He is now 8 years and 10 months post-transplant, but in June of 2013 Garran was diagnosed with Bronchiolitis Obliterans Syndrome (IE Chronic Rejection). 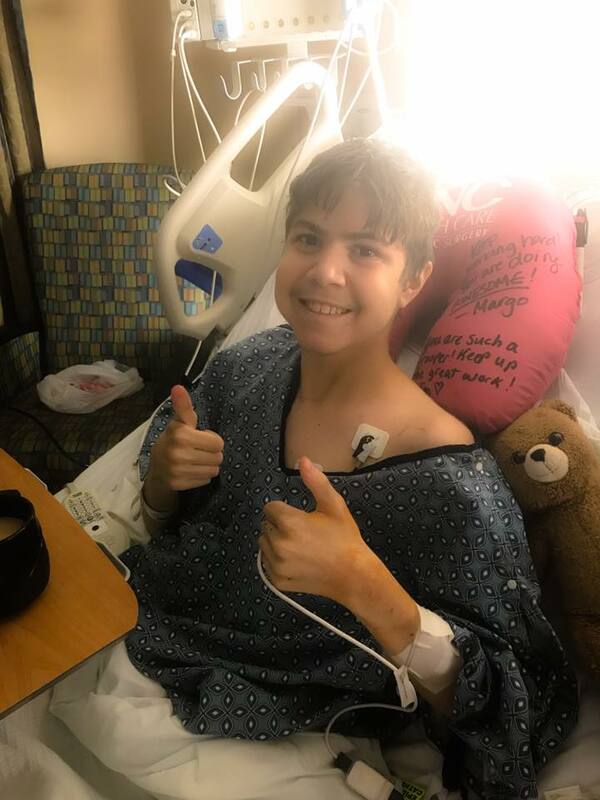 We have tried various treatments including photopheresis where they placed a dialysis catheter in Garran’s chest and he had to get treatments every week for about 6 months, in an effort to forestall the inevitable, but at this point Garran needs new lungs yet again. He is currently at 17% lung function, 24/hour a day oxygen and gets IVIG every other monthto treat Donor Specific Antibodies (another form of rejection). He will not survive without a second lung transplant. We are happy to announce that on October 29 of this year Garran received his life-saving second lung transplant! We hope he will be well enough to celebrate with us at this year's event!